The root node does not contain letters, but every other node other than the root each contains a single uppercase English letter. For a path from the root to any node, the letters on that path are joined together to form a letter sequence which is the corresponding word of that node. Each word from the word list has a corresponding node on the trie. 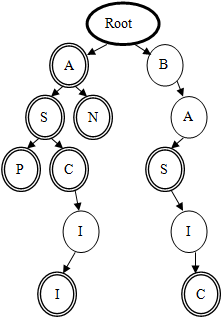 Under the above conditions, the number of nodes in the trie must be as few as possible. Ex. The following is a word list and its corresponding trie. Given a particular word list, please find the number of nodes in the corresponding trie (including the root). The input contains a word list, with one word per line. Each word will consist of only uppercase letters, and will not exceed 63 characters in length. The total length of the input will not exceed 32K, and there will be at least one line of data. The output should contain one integer, the number of nodes in the trie constructed from the given word list.